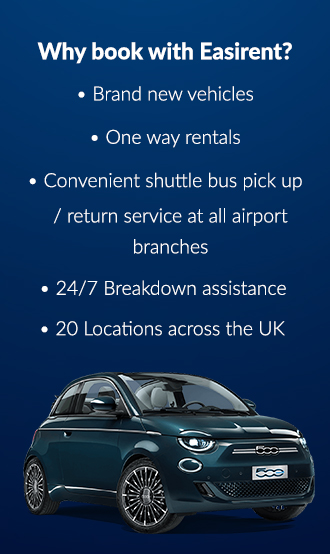 At Easirent we offer the Lowest Rates on Car Hire in the UK and consistently bring you great prices on spectacular cars. How do we do it? It’s a mystery! But we do. And we’ll be astounded if you can find a cheaper price on Car Hire in the UK for your chosen dates. If you do find a cheaper quote, We Want to Beat It! Speak to our reservations team today and send them a screen capture of any genuine quote and they’ll do their best to deliver our Price Match Promise. Price promise is subject to availability during peak periods. Rental length must be between 1-10 days. The competitors quote must be for the same category vehicle (size, engine, make). The competitors quote cannot include insurance. The competitors quote must be on similar dates to your chosen dates (e.g. a bank holiday weekend versus a quiet week in May). The quote can be sent in a link or screen capture to reservations@easirent.com or on our Live Chat. The competitors price must be publicly advertised online and cannot include any membership/personal discounts. No other promotional offers or vouchers can be used on top of a Price Match. The agent will complete your booking on your behalf at the time of Price Match.